Port officials on Tuesday are expected to consider $300 million in financing that would prepare the country's largest oil-export port - Corpus Christi, Texas - to handle a surge in U.S. shale production over the next five years. International buyers would like more U.S. crude but are unable to get it because of infrastructure constraints along the U.S. Gulf Coast. 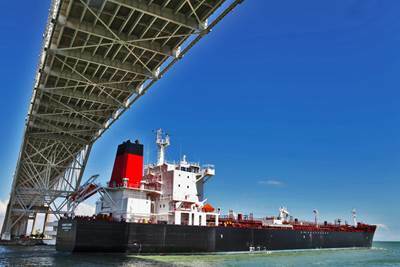 Terminals originally designed for imports only recently have revamped operations to handle exports including accepting larger tankers preferred by China and other oil buyers. The Port of Corpus Christi Commission is voting on a plan that would authorize it to raise the debt next month through underwriters led by Wells Fargo & Co, Citigroup Inc and JPMorgan Chase & Co. The port is prepared to levy new user fees for the debt costs if the U.S. government does not reimburse it for spending the money to deepen and widen port facilities to accept larger ships, according to a port official. A decision to raise fees for dredging, which could begin as early as September, would be rare among U.S. Gulf Coast ports. "We don't want to be the next bottleneck" to U.S. oil exports, said Sean Strawbridge, chief executive of the Port of Corpus Christi Authority. The United States is now exporting more than 2 million barrels of oil a day, but the largest tankers currently only move in and out of a Louisiana offshore port because others are not deep enough. Corpus Christi exports 800,000 barrels per day (bpd) of crude, Strawbridge said. It sits on the U.S. Gulf Coast near two of the nation's largest oilfields, the Permian Basin and Eagle Ford shale, which together produce about 4.7 million bpd, nearly half of the total U.S. production. The channel's existing 47-foot-depth restricts it from fully loading crude tankers that carry up to 1 million barrels. Smaller vessels must finish loading the tankers offshore, he said. The project will deepen the channel to 54 feet for larger tankers, he said. Oil export capacity from the Corpus Christi area is expected to rise to 3.3 million bpd by 2021 from 1.3 million bpd this year, keeping its rank as the top oil export port, according to energy research firm Wood Mackenzie. This year, the south Texas port received $36 million from the U.S. federal government to start work on a $335 million expansion that would allow Corpus Christi by 2021 to accept tankers with capacity of 1 million barrels of oil . The port contributed another $44 million and aims to use that money and the debt to expand the ship channel. "To continue to compete against OPEC, over time we have to have a better system of getting the oil offshore," said Sandy Fielden, an analyst at equity research company Morningstar.